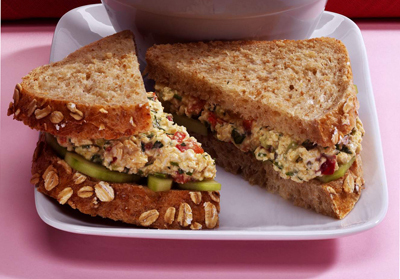 This tasty sandwich filling is lower in calories than the traditional egg and dairy version and is bursting with fresh herbs. Even your old-school uncles will enjoy this naturally cholesterol-free option at the next family picnic. Break the pressed tofu cake in two with your hands and crumble each half into a food processor. Add the vegan mayo, mustard, capers, garlic, turmeric, parsley, tarragon, celery, bell pepper, chives, salt, and pepper. Pulse the mixture 10 to 15 times until well combined. You may need to scrape the sides down a few times with a rubber spatula. Lay 4 slices of bread on a clean work surface. Thinly slice the cucumber and pat each slice with a clean kitchen towel or paper towels to remove some of the moisture. Lay the slices of cucumber on the bread slices in a single layer. Spoon 1/4 of the tofu mixture on top of the cucumber slices on each piece of bread. Top with the remaining bread slices, season with salt and pepper, and cut in half to serve. Per serving: Calories 393 (208 from Fat); Fat 23g (Saturated 1g); Cholesterol 0mg; Sodium 1,104mg; Carbohydrate 27g (Dietary Fiber 5g); Protein 14g.